24th January (Thursday) 09.30pm Return to New Delhi by Air India Flight. i. In New Delhi: The participants will have to arrange accommodation on their own. ii. In London: The Participants are requested to arrange their accommodation in London through Indian High Commission. 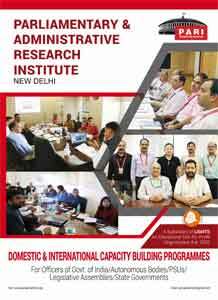 Domestic & International: The participant will have to arrange for their domestic travel and local conveyance for attending training programme in New Delhi; The Participant has to also arrange his/her own return air tickets for travelling to London as per entitlements and apply for visa and Political Clearance immediately after nomination. The Local conveyance to reach the Training Place and back to the Hotel will also be the responsibility of the participants. However, in London, the participants will be received at the Airport and seen off by a representative of the London Training Institute. Cancellation can be done 30 days before the start of the course for full refund. If the cancellation is done between 30 days and 15 days before the start of the course, then 50 % of the fees will be refunded. If the cancellation is done within 15 days of the start of the course, no fee will be refunded. Note: Kindly strictly adhere to the time schedule as we are required to transfer funds to our counterpart in London at least 45 days in advance.